Kids love to bake, and since this chocolate torte is so easy to make, it’s perfect for pint-size kitchen helpers. 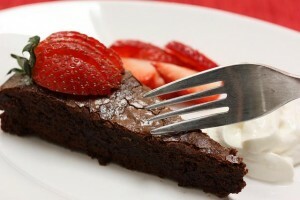 Though our torte may seem too decadent coming from two dietitians, it’s surprisingly low in fat and calories. SPECIAL OFFER: SchoolFamily.com readers can purchase No Whine With Dinner at 30 percent off the list price, and get free shipping, by ordering the book here and using this promo code: FS2011. Butter the bottom and sides of a 9-inch springform pan and dust the bottom with granulated sugar. Set aside. Place the chocolate chips and oil in a medium saucepan over low heat and stir until the chips melt, about 2 minutes. Remove from the heat. Whisk together the sugar, flour, and cocoa powder in a large bowl until well combined. Whisk in the eggs until well blended. Add the melted chocolate and stir to combine. Pour the batter into the prepared pan. Smooth the top with a rubber spatula. Bake 35 minutes, or until a toothpick inserted in the center comes out clean. Transfer the pan to a wire rack and cool completely. When cool, remove from the pan, sprinkle with powdered sugar and serve with the strawberries and the whipped cream as desired.